The design on top is inspired by the Chez Remy restaurant logo, seen at the end of the film and on the Chez Remy sign at the restaurant in Disneyland Paris. To make the cake, I used Miss Jones Baking Co’s cake mix and frosting. Miss Jones Baking Co’s mixes and frostings are unique since they are made with real ingredients (no hydrogenated oils, no trans fats, no artificial flavors or colors), and they are made passionately by real bakers! So what better way to send the message that anyone can cook than with these amazing tasting and real mixes from Miss Jones Baking Co? I have tried a few of her mixes, and trust me, they’re much better than a store-bought pre-made cake! They have a wonderfully comforting, homemade taste to them! Once baked, let cake sit for 10 minutes and then remove from tins onto cooling rack, allowing it to cool for at least an hour. While cooling, melt chocolate combined with 1 Tbsp coconut oil, the place in a piping bag. Either use a small round tip or cut a small whole in the bottom of the bag. 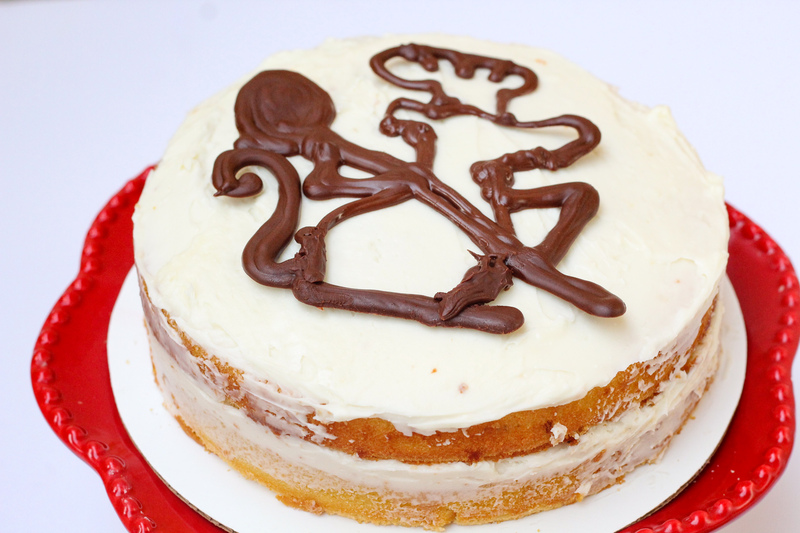 Use the piping bag to pipe the Chez Remy design on parchment paper, and place in the fridge or freezer to harden. Once your cake is cooled, stir your frosting to soften and spread in between your layers of cake, and on top. Place your Ratatouille design on top of the cake, and it’s ready to serve!